If I'm understanding the description correctly, this is a "stereo" system, right? In other words, it has separate left and right output channels and we can set it up to watch a movie with our outdoor theater in stereo, right? BEST ANSWER: Yes, you can watch a stereo movie at it: I play music from my phone through it all the time (has a 1/8th inch input jack). I use mine as a PA system, and PA systems are best run in mono, so that is what I do. I think, stress think, that you can use this in stereo mode, although I have never tried that. I drive mine off of a notebook computer, and I merge the stereo output from the notebook into a single mono XLR, which then drives both speakers in this system. Correct. That's exactly what we use this PA for--outdoor movie night at our subdivision pool. And it works well for that. If you look closely at the pics, you'll see stereo inputs in the center of the control panel. Yes, this has stereo output. You provide right and left channel. you you can hear them independently on the right and left speaker. Yes, it considered a Stereo. Though you will not get a Surround system feel. I mainly use it for Karaoke, which it is perfect for. I purchased this and it is stereo output. Use it for the same purpose, and love it. Yes. That's what we use ours for. It works really well for outdoor use. Can they sit sideways on the floor and angle up or is mounting them to a stand the only practical option? BEST ANSWER: Unless yo get a right angle Speaker cable end, do not try the floor-facing-up configuration. The plug sticks out and the stress on the joint is too much. That's a problem. There is no angle built into the plastic enclosure. I wouldn't recommend sitting them sideways as the rounded sides don't give much stability. I use the stand but sometimes I will o put them on a chair when I don't feel like setting up the stands. I hope this helps. Mounting to a stand or sitting vertical on a table or shelf are really the only practical options. the plastic cases are rounded and not made to sit horizontally. Yes, you can lay them on their sides. You may have to prop them up a little so they are pointed toward your ears. I have used them with and without stands. If you can find a foam wedge (we use a towel as this is for a swim team) to keep it from rocking back and forth it still works great. Try placing them any where, in a corner will give you better sound.On their side may require a sandbag. Yes, they can sit sideways in the floor. Can the line input be used for standard Mike, non XLR ? BEST ANSWER: I've never used the line or auxiliary inputs. My only concern is that the input impedance might be incompatible. I think the mike impedance into the XLR jack is 500-600 ohms. The line or aux input might be high impedance, several thousand ohms. If that fails, you can make or purchase an adapter to match your mike connector to the XLR. No. You need to get an adapter to use it. The 1/4 inch is for audio in only ... like your computer or other powered outputs. Yes it can use 1/4" Jacks for microphones as well as XLR. Though limited to 4 Channels. Yes, 1/4" Tip sleeve connection. Can I use it with only one speaker connected for a smaller room or would the open end cause a problem for the amplifier? BEST ANSWER: It is a mono amp with parallel speaker outs. No problem running one. Be sure debris does not enter the other jack and cause a short. Though you would only get mono output. There are Mono speakers out in the Market, if that's all you need. Yes, you can use it with only a single speaker, with no issues at all. You can use only one speaker. And it still sounds great! Yes you can and it won't hurt a thing. can a sub be added? BEST ANSWER: The amp has an a couple of output lines that you can connect a sub to. The amp itself may not have enough power to push both speakers and a sub. I recommend a powered sub. If you mean a mixer for multiple input sources, feeding into a single line output, then into this PA, yes. Thanks for the reply, I mean can i line out to a sub? Check the manual. This unit has speaker outputs (L-R), monitor line outputs (1/4" L-R) and line outputs (RCA phono L-R), plus a mini-phone headphone jack. The monitor outputs have a volume control, but no balance or L-R pan. Has anyone tried to run this on a generator? I'm frequently without power and would like to buy a generator but I can't seem to figure out how many amps 95 ~ 250 VAC works out to. Will a tailgater style generator be sufficient? BEST ANSWER: It does not draw many amps so it would probably be enough power. But a tailgater generator does not have a ground so it will most likely have a wicked buzz in the sound. A generator will work, but use an inverter generator, as these have clean power signal. Works great on a 1000 watt. Is there any way to add more power such as an external amp? Or can the watts be increased some other way? BEST ANSWER: Yes, you can connect an external amp to the Monitor Ouput 1/4" jacks. Be sure to start with the monitor volume level low and increase as needed to avoid overdriving/clipping your external Amps input ports. Also you would need other speakers if you use a bigger amp, i.e. 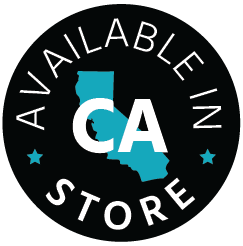 Buy a bigger system meant for your needs. 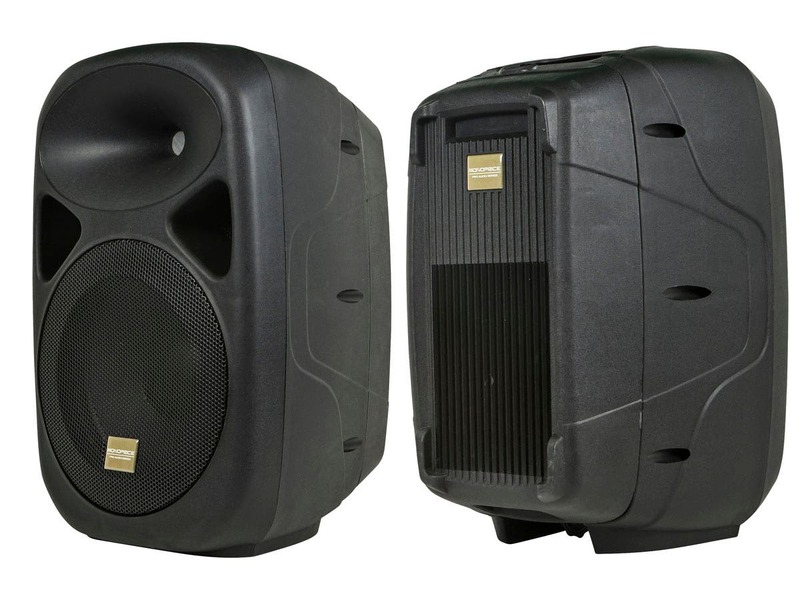 This is a good indoor speaking and acoustic system but it's not meant for outdoor venues or a rock band. I run a Peavey 100watt amp as one monitor to give me more base and an other amp as a monitor. gives me enough power for small venues up to 100. I also feed the auxiliary side with a boom box for C Ds. What are the dimensionsof the speakers? What are teh dimensions of it shiped? BEST ANSWER: The speakers with the backs off measure about 19.25 inches tall x 9 inches deep. The shipping carton the PA and speakers came shipped in measures: 21.75 inches tall x 25.5 inches wide x 15 inches deep. Rough measurements: My shipping box was 25"x22"x15". The speakers are 19"x12"x12.5" (with backs on). can I connect a wireless mic receiver to this and does it have audio inputs for tv, ps3,laptop, appletv, etc? Yes you can and very easily. We installed this unit in our church basement, and added a wireless mic package to it. Works great. What are the dimensions of the shipping box and the speakers themselves? Paired better with Monoprice 8-Inch 60-Watt Powered Subwoofer, Black Product ID: 8248 or Monoprice 12in 150-Watt Powered Subwoofer, Black(Limit 10 per Customer) Product ID: 9723? Does the monitor out required powered monitors or is it enough to drive unpowered floor speakers? BEST ANSWER: The monitor out will need to be plugged into powered speakers or an amplifier. what is the schmatic for the pa system? 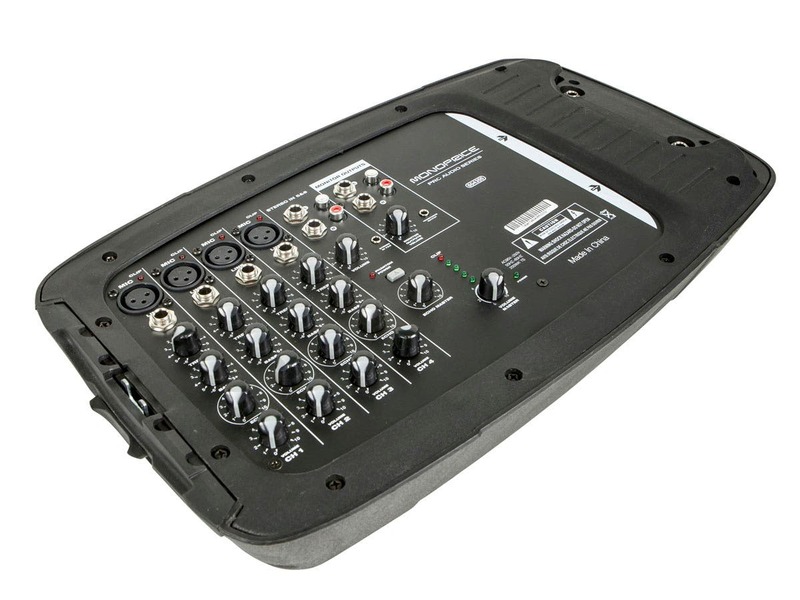 BEST ANSWER: It is actually a 4 channel system with 8 inputs (4XLR and 4 1/4 inch) works very well in a smaller venue such as band rehearsals. My guitar effects processor has stereo out at line or mixer level, via 2 separate cables with 2-conductor, quarter inch connectors. My tablet has a 3.5mm headphone port I use for sending out stereo MP3 backing tracks. Can I simultaneously plug my guitar processor into the L/R quarter inch jacks AND my tablet into the 3.5mm jack of channel 5/6 of the mixer, with stereo results of both devices? BEST ANSWER: It is not recommended but it is possible. You will be very susceptible to ground noises. Set your guitar rig up first and set levels. Then plug in the tablet, be sure to start with the volume all the way down as this is your only volume control for your background tracks. If I need to add 2 more speakers which ones should I choose? BEST ANSWER: You should use powered speakers. The amp in this unit is only good for 2 speakers. The APS10 are similar size. I got this P.A. and set it up and my band uses it all the time. it has the power for us in rehearsal and is easy to take to a gig. The sound is very clear and makes it easy for us to play agig. Purchased for business events and lunch & learns. Design is good with storage for cable in one speaker and mixer board in another. Very easy to transport. Sound is good for the price range and would probably do fine for a single musical act as well. Only downside is the case material scratches very easily. This doesn't affect sound performance, but visually it can be a sore. Also, the storage section clip that secures the door is frustrating to open and close. This too is not a deal breaker. 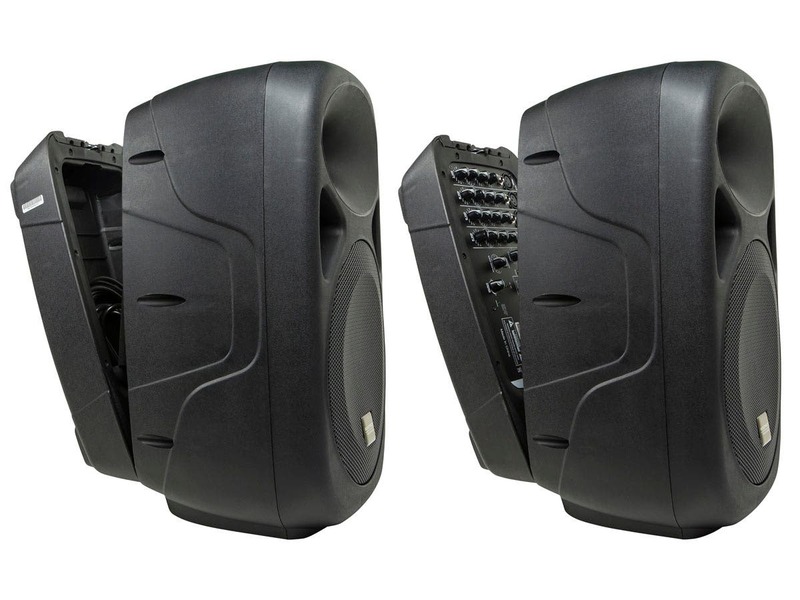 The 130 watt PA with 10" speakers Is one of those bargains that Monoprice is so good at. Plug a keyboard into one of these and see what it really sounds like. I wish that the print on the speaker plug arrows was larger- the speaker L and R are reversed relative to the RCAs. I wish the stereo inputs had the same controls as the others, but. It honestly sounds fantastic for the price and size. They're easy to carry and put in a car trunk. The handles do squeak, but feel secure enough. None of its deficiencies are impossible to accommodate. The storage cubby is big enough to add a couple more cables, which is handy. 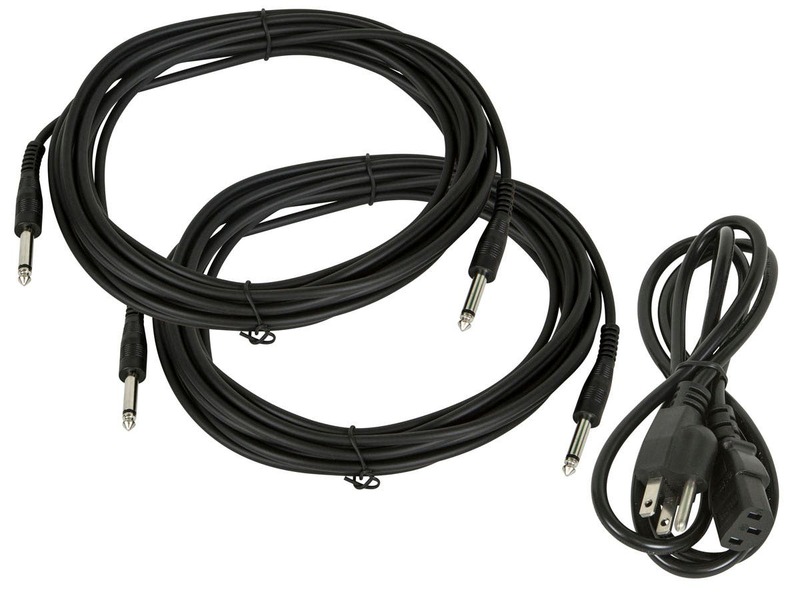 The included speaker cables are long enough to get plenty of separation. Handy to take out on the porch to play a phone through, too. Shipping is expensive owing to its heft, so keep in mind what final price will be. Instead of renting a PA for a party I bought this instead for not much more $. Works great. Easy to setup. the back panel on one came to me broken. The other also broke so the back panels no longer snap together the plastic is not good quality. 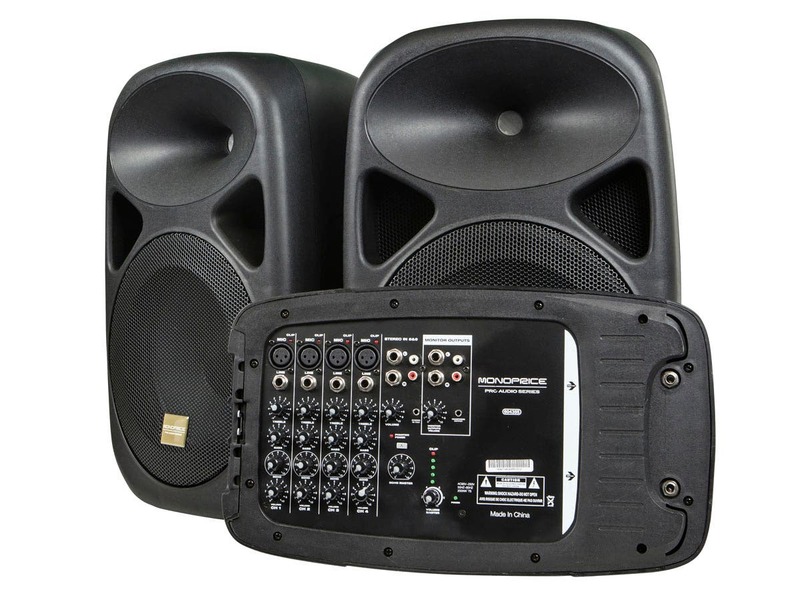 However, I use it for church and social hall events and it's easy to setup and the sound is good. Great speakers. They sound great and will fill a room very nicely. These speakers will fill a medium sized room with sound. The included cables are long enough for most. I drive these off of my computer when I am working a smaller room. 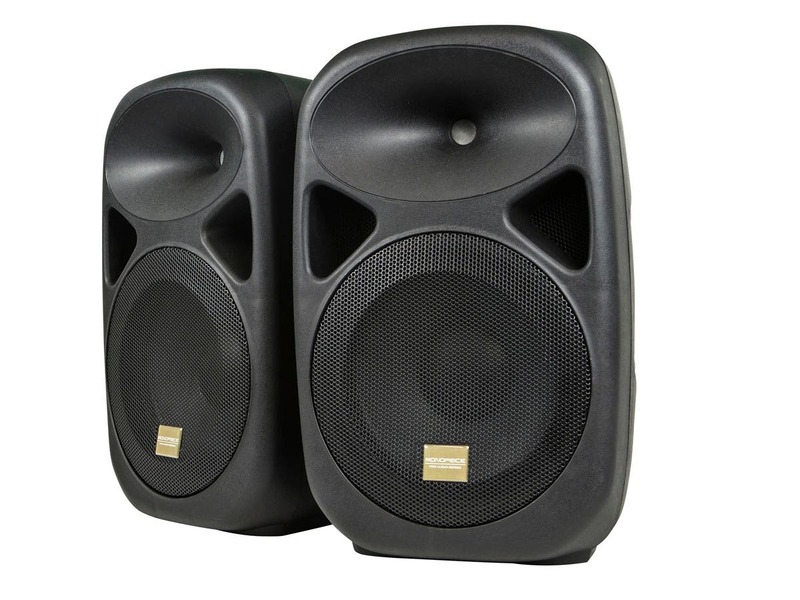 For a larger room or dance hall, I have a pair of powered 15 inch PA speakers, but these are just right for a private party, in a big living room, or outside on a patio.